Step 1: Set up your grill for indirect grilling and preheat to medium (350 degrees). Step 2: Spread a rimmed baking sheet with foil (this facilitates cleanup). Lightly oil a wire rack using a paper towel and place it over the baking sheet. Step 3: Brush each bacon slice on both sides with maple syrup. Step 4: Spread out the brown sugar in a baking dish. Dip each slice of syrup-coated bacon in the sugar, pressing it into the sugar. Invert to coat the other side. 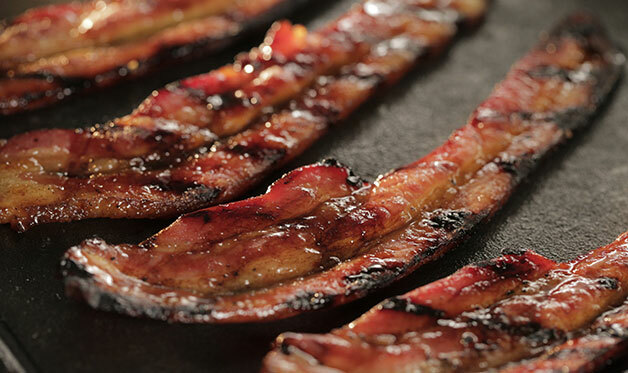 Arrange the bacon slices on the wire rack, leaving 1/4 inch between each. Step 5: Indirect grill the bacon until browned and crisp and the sugar is caramelized, 15 to 25 minutes, depending on the thickness of the bacon.